There are multiple ways to see David McEown. You could make an appointment to meet the acclaimed Canadian watercolourist and see his paintings in his Vancouver or Richmond Hill, Ont., home studio. Or you could attend one of his workshops. Perhaps you might catch him at a presentation or an exhibition opening. But the best way to see McEown (maybe the only way you should see him because everything else pales in comparison) is when he’s seated at his easel in the world’s last great wilderness: Antarctica. McEown has worked in the region for 25 years, spending the last eight exclusively as an artist-in-residence with One Ocean Expeditions. Here, he discusses his work in the Antarctic and the once-in-a-lifetime experiences it offers. It’s funny. I’ll be out on deck looking and painting, and passengers will say, “What are you looking at?” And I’ll say, “Well, what do you see?” At first, many of them will say there’s nothing out there, but it doesn’t take long for the colours and forms of Antarctica to hit them, and that’s what I want them to notice. What colour is that iceberg, really? Look at its incredible tones. Look at that mountain and really examine its shape, follow its lines. I’m getting people to see those things but I’m also getting them to interact with the landscape. By slowing down and painting the shapes, light and colour, you get an enhanced awareness of where you are. 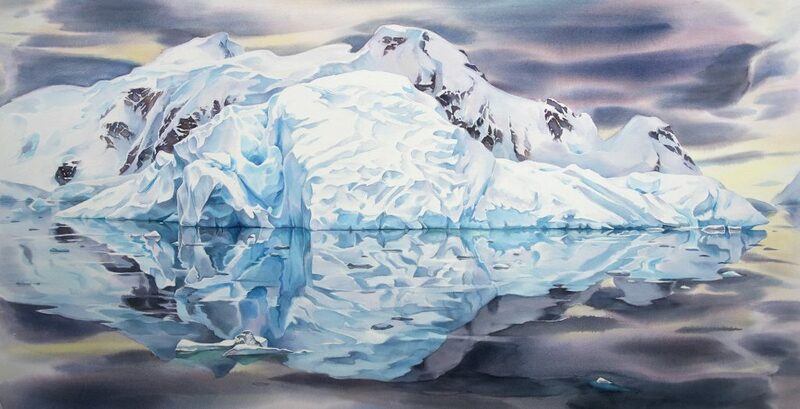 Courting n.2, painted on the sea ice near Snow Hill Island, Antarctic Peninsula. It’s nice to not have to deal with the darned trees, for one thing. I think artists love to go there because there’s not so much clutter — you’re dealing with pure form. Yes, it’s sometimes hard to get that sense of scale, but the simplicity of the shapes really takes you back to the basic elements of art. It’s a great opportunity to practise composition, to go back to being a beginner, even if you’re an experienced artist. I like that watercolour reflects that you’re in a region where you’re dealing with vapour, ice and light shining off the sea. Watercolour has this ability to quickly define a very sharp edge and a really wet, soft edge — of a cloud, say, cutting off the top of a mountain. So there’s an immediacy to it, but it’s also a contemplative medium. You put your mark down and what you see is what you get; there’s no ability to correct that kind of thing, which you have when you work in a medium such as oil, which always tempts me to mess around too much. It requires a lot of attention to get that first mark right, and I find I slip into a sort of timelessness when I’m painting. And it’s fun, too, because you can let the environment influence the painting. Passengers will watch with great amusement as I sit out on the deck and incorporate splashes of water from the Drake Passage into a painting, or work in sub-zero temperatures and watch my paint flash-freeze so I can create an image with ice crystals on it. Antarctic Sound n.2 Painted in Antarctic Sound, looking toward the Weddell Sea, February 2017. “Having that flash-freeze effect on the paint was a career highlight,” McEown says. I’ll set up my easel and wait quite a while to understand the dynamics of the beach, because you don’t want to be in a spot where animals normally pass through. They’re not really habituated to people, so they’re curious, but not usually aggressive or territorial. I’ve had king penguins come up, take a look at the palette and canvas and move on — “Nothing much interesting to see here,” they seem to be saying! 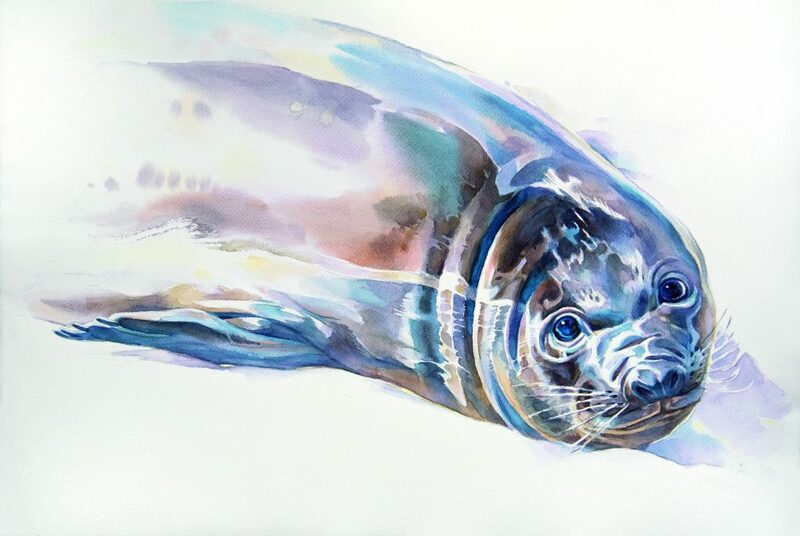 I’ve had an elephant seal pup get a little too close and start nudging my easel, looking for milk or something. We never approach the animals, of course, but encounters like this happen, and when they do, it’s a once-in-a-lifetime experience for many passengers to have that sort of innocence right in front of them. Elephant Seal Pup, South Georgia Island. Petermann Island, just south of the Lemaire Channel on the Antarctic Peninsula. The dramatic views of Booth Island and the continent rising out of the ocean provide endless compositional inspiration and reflections that are often amplified by masses of icebergs moving or grounded by the tides. Petermann is an important nesting site for birds, including changing populations of different penguin species scientists have studied for decades. 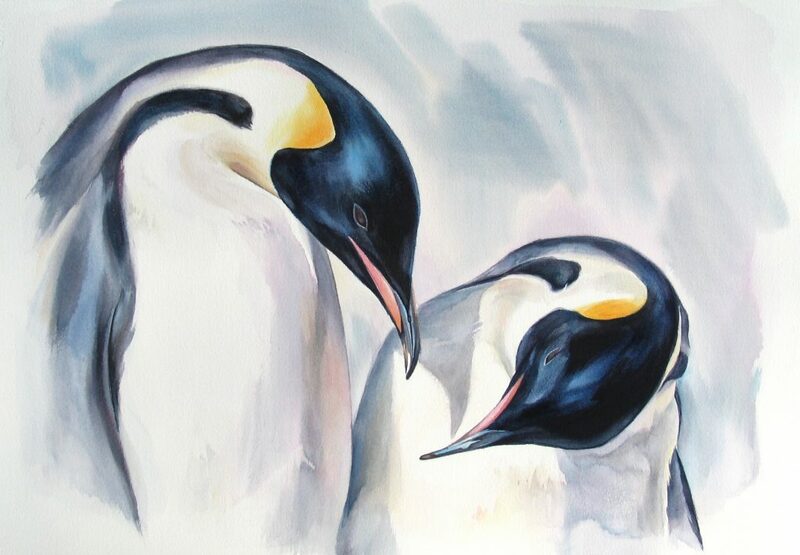 In just one painting session, I observed gentoo, chinstrap and Adélie penguins while blue-eyed shags flew nervously overhead, reacting to a leopard seal hauled out on shore nearby. We’re all humbled by the polar regions, and I always think of being there as a chance to reset my senses — to clean my palette, so to speak. Being in Antarctica wipes the slate clean of our preconceptions of our ordinary lives because we’re experiencing an otherworldly, almost fantastical place that we’re not used to. I remember being a bit overwhelmed and anxious about missing something on my first few journeys, because you can’t help but want to take it all in. But now I tell people that the quality of what they see is more important than the quantity. Quality, gratitude and humility — that’s why we go to Antarctica. 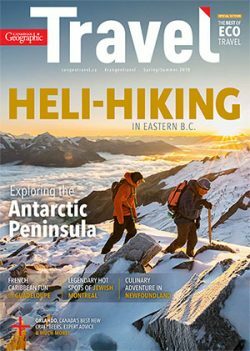 One Ocean Expeditions is offering more than 35 incredible journeys to the Antarctic region in 2018-2019. For more information on these once-in-a-lifetime experiences, visit One Ocean Expeditions.